What do you buy for the book lover with an overflowing bookshelf? 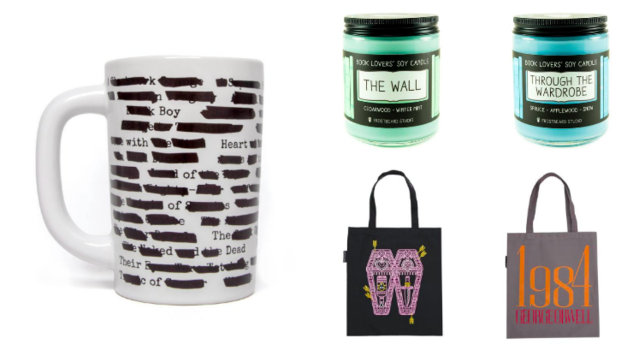 Paste has you covered with nine creative gift ideas for bibliophiles. From literary rocks glasses to miniature sci-fi hardcovers, these presents are sure to delight the readers in your life. And with price tags under $20, they won’t break the bank this holiday season. For even more gift ideas, check out our gift guides with presents over $20 or Star Wars items. Out of Print’s charming mugs are perfect for readers, and this one is our absolute favorite. The Banned Books Mug sports crossed out titles of books that have been challenged or banned in the U.S. But when you pour a hot drink into the mug, the censored marks disappear! Sci-fi and fantasy readers will love these new mini editions of six popular books. And at only 4 × 6 inches, they’re the perfect size for stocking stuffers. Each month of this calendar features a different design highlighting a literary line, ranging from Jane Austen to Langston Hughes. It also includes a petite wooden easel to display the calendar’s eye-catching images. After the 2016 election, Chavez created spaces for people to express themselves and write notes in New York subway tunnels. Thousands of people penned messages, and Signs of Hope features hundreds of these poignant Post-It notes. These small glimpses into other’s lives will tug at your heart, giving your faith in humanity a much needed boost. This is where boozing and reading meet. Check out these 11 oz. rocks glasses inscribed with the first lines of famous books. Hamlet? Treasure Island? Jane Eyre? You got it. There’s no better way to carry books than in a bookish tote. Out of Print offers 30+ tote designs celebrating classics, including Romeo and Juliet, 1984 and even Nancy Drew. DeGraff charts the routes iconic characters traveled with this whimsical “atlas.” From The Princess Bride to The Shining, 35 films get translated into intricate maps in this stunning book. Frostbeard Studio’s soy candles immerse book lovers in their favorite scents. Enjoy the smell of tattered pages? Pick up an Old Books candle for a whiff of paper and vanilla. Wish you could frolic with Tolkien’s hobbits? You’ll love the hint of clover and pipe tobacco in The Shire candle. From Winterfell to Sherlock’s Study, Frostbeard Studio boasts 17 scented candles sure to delight bibliophiles. With the convenience of online shopping, it’s easy to forget how fun it is to visit a physical bookstore. A trip to an independent bookstore will inspire tons of great ideas, and readers will embrace any excuse to spend an afternoon browsing shelves. Use this directory to find an independent bookstore near you.